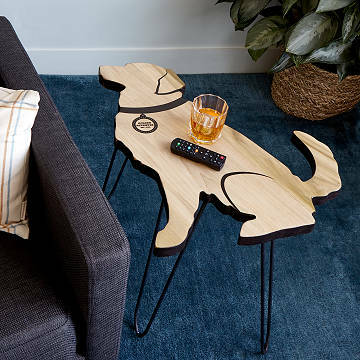 Crafted from reclaimed poplar wood, this rustic table is an homage to your pup, who's always by your side. Always by your side—that's your pup. This rustic table is an homage to them and that loyal trait, with a surface in the shape of their breed. Crafted from reclaimed poplar wood, each is hand-sanded and given details like a collar printed with the breed name and the year it was recognized. It's hand-finished with a contrasting stain along the edge, and sturdy-yet-stylish iron legs mean it'll last through plenty of tail wags to come. Made in Pilesgrove, New Jersey. Dust with a cloth when needed. Sizing may vary depending on dog shape.